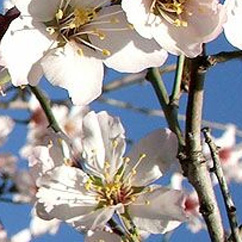 Sweet almond oil (Prunus amygdalus var. dulcis) is a very versatile plant oil and is extensively used in cosmetic manufacture as well as aromatherapy. It has a light, non-greasy texture and is easily absorbed and helps to keep the skin soft whilst balancing the loss and absorption of moisture. It is a oil that not only absorbs very well, but penetrates the skin to nourish it, without leaving the surface oily and has a high concentration of oleic and linoleic essential fatty acids. Chemically it is classed under the fats and oils heading and its function is listed as an occlusive skin conditioning agent as well as a fragrance ingredient.